So we're back from London! Okay, we've been back for a few weeks, and I haven't given you an update lately because, well, I've been busy. Darn busy. But I thought I'd better give you an update before you all decide I must have disappeared in an ash cloud somewhere over Iceland. We premiered the first DVD at an old movie theater in Notting Hill near Kensington Palace. Lot's of fun! 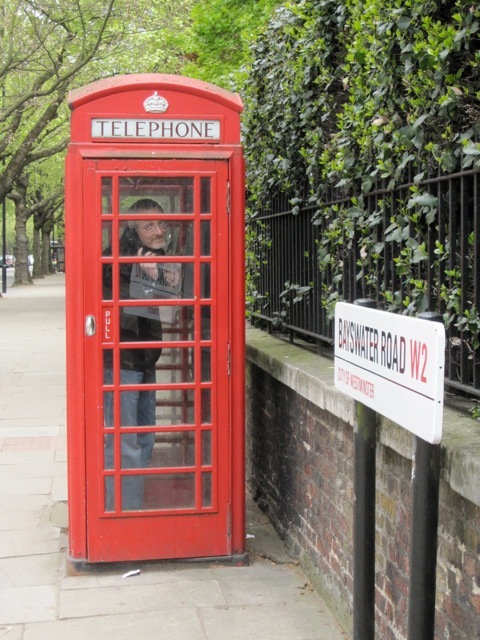 I did a bunch of radio interviews covering much of the UK, which all went very well except for the guy who really wanted me to peg down where EXACTLY in England Clive and Ian grew up, because he couldn't quite place their accents. I think I said something about also doing a very bad German accent on the show, so I was an equal-opportunity accent offender. 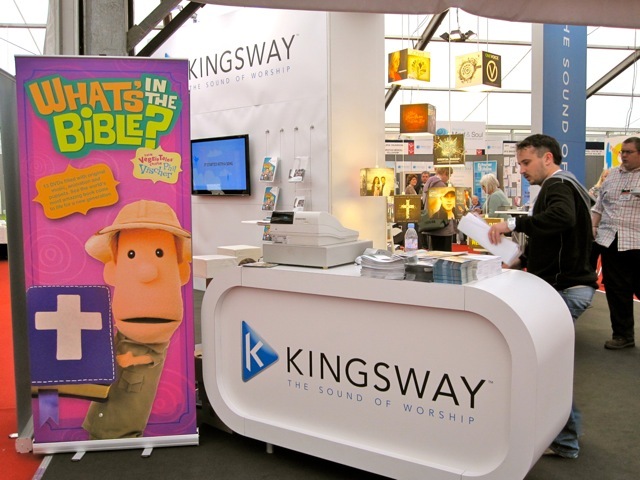 Hopefully the word will spread around the UK that there is a really fun, new way to teach the Bible to kids (and their parents!) and we'll start to see an impact. I have to get back in the studio now – we're doing a really fun new series of shorts in partnership with Awana Clubs called "Clive & Ian's Wonder-Blimp of Knowledge" where Clive and Ian fly around in a blimp finding answers for kids questions about God. It's kinda weird. The blimp pilot is a monkey. Of course. I'll give you a peak as soon as we finish the first episode. PreviousWhat’s in the Bible #3… and off to England! NextWow – what a couple of weeks it’s been! Just wanted to let you know that we’ve been taking our kids, 12, 7 and 5 in family viewings, prayer and discussion/instruction via WitB. You madman, it’s working! How will “Clive & Ian’s Wonder-Blimp” (Best title ever!) be released? YouTube? DVD Bonus Features? JellyTelly? Jellyfish Land (haha, yeah right.)? You tease us Phil! I laughed at your post, thanks for brightening the afternoon Phil! Just got “What’s in the Bible” #3. The whole house is gripped. There’s one in Savannah Goergia too. How do we know your didnt use your evil mac-ness to…yeah! Uh huh. Hmm, I think we’ll have to see your place ticket sir. Step out of the car…er…blog please. Oh yeah, happy early birthday! My family *loves* “What’s In The Bible”. My 3 year old sings (part of) the theme song on a regular basis, and tries to say “Buck Denver,” but usually comes out with “Duck Benber” or some other permutation. “Man of News!” is also a popular statement. Actually, the ones old enough to talk all sing it, and the two youngest dance. We picked up our 3rd installment today (woohoo)! We’re taking a really long road trip in a week and got it for that, but hubby and I have discussed pulling it down to watch, just the two of us, after the kids go to bed–I don’t think he and I can wait. I ALSO bought Jr.’s Giants and Hermie–neither of which I had exposure prior to Jelly Telly and are now family faves. My 4 year old had a very naughty day yesterday. At our bedtime prayers he thanked Jesus for loving him and for paying for his sin. After prayer, he said, “That’s what they said on ‘What’s in the Bible’, that Jesus came to take away my sin.” Now, for all of the times I’ve tried to explain it, he really GOT it from your movies. Thanks for inspiring my attempt at an animation career. I’ve been drawing cartoons for 11 years partially thanks to the Water Buffalo short. Happy birthday (yesterday) Hope it was fun! Thanks for the update. I am thrilled that you were able to hop the pond and share the Bible with a culture that really needs the message. We are preparing for a What’s in the Bible Birthday party for my 5 Yr old. He loves it so much that he want’s it a part of his BIG day, so we are making it happen. Keep bringing us more positive material to help train our children in the way that they should go! If anybody skipped the review by Dallas Theological Seminary; go back and read it. These guys don’t mess around. If somethin’ ain’t right, they will point it out. They seem to have given the videos an A+. I was just about to send you a message with the exact same question! How did you know? The best part of the videos; the part unlike any other video series for kids I’ve ever had, is that the kids read the Bible afterward. My 11 year old reads and reads and reads. He sometimes goes into his room and sits on his bed for what seems like a couple of hours reading the Bible. Hi – it’s July 5th, 2010. Just read your interview in In Touch magazine. Jumped on line and spent all morning reading your story. How can I once and for all kill my “Christian” ambition? I’ve been living with the dream of writing the “great American Christian play” for almost 20 years, now. I can’t begin to tell you how hanging on to this nagging dream has sabotaged my life. I had a good paying job, a career in the biotech/pharma industry. But, I never found any joy in my work. I told myself it was because I wasn’t working for a Christian organization serving God. I got involved in a pentacostal church in Northern CA. I quit my job in Dec 2009 because I truly believed I was obeying God. Seven months later, I’ve stopped writing altogether, I’m still unemployed, pulled away from the pentacostal church and am in danger of losing everything, including my faith in Christ. It feels like I will never recover. I know my experience is just a fraction of the crisis of faith you went through. After, reading your story, I turned on the TV and “happened” to see a documentary entitled, “Audience of One”. It is the story of a pentacostal pastor who truly believes God told him to build a movie studio. Hi – itâ€™s July 5th, 2010. Just read your interview in In Touch magazine. Jumped on line and spent all morning reading your story. How can I once and for all kill my â€œChristianâ€ ambition? Iâ€™ve been living with the dream of writing the â€œgreat American Christian playâ€ for almost 20 years, now. I canâ€™t begin to tell you how hanging on to this nagging dream has sabotaged my life. I had a good paying job, a career in the biotech/pharma industry. But, I never found any joy in my work. I told myself it was because I wasnâ€™t working for a Christian organization serving God. I got involved in a pentacostal church in Northern CA. I quit my job in Dec 2009 because I truly believed I was obeying God. Seven months later, Iâ€™ve stopped writing altogether, Iâ€™m still unemployed, pulled away from the pentacostal church and am in danger of losing everything, including my faith in Christ. It feels like I will never recover. I know my experience is just a fraction of the crisis of faith you went through. After, reading your story, I turned on the TV and â€œhappenedâ€ to see a documentary entitled, â€œAudience of Oneâ€. It is the story of a pentacostal pastor who truly believes God told him to build a movie studio. I went out and bought all three of the DVDs as soon as I got my “allowance” from my wife, with the intent of showing them to my Sunday School class (4 yrs through 4th grade). With such a large age range, I was a bit worried that it might be overwhelming, but it was a big hit! Personally, I’m thrilled to also get my “Rhett & Link” fix, cause those guys are my favorites, and I hope to see them again and again. Phil, your explanations are right on target for my students. We’ve been going through an overview of the Bible this past year, summarizing each book and trying to give them an idea of how important each one is, even the ones that sound ‘boring’, and your series couldn’t have come at a better time! Praise God for your talented team and the desire he put on your hearts to do this series! And keep ’em coming! Thank you so much for all you’ve done to share the truth of God’s love with children and families. My children, my husband and I have all benefited so much over the years from your projects/offerings. Thank you to your family for helping ours teach tell the next generation of His love and faithfulness.